Off-campus access to subscription databases and electronic resources is restricted to currently enrolled students and actively employed faculty and staff of the University of New Orleans. The public is welcome to access these resources (with some exclusions) from the visitor computers in the Learning Commons on the first floor. Always start from the library homepage to access the databases from off campus. From the Library homepage click on the databases tab. From this tab click through to the database you need to search. If you are using a commercial Internet Service Provider (Cox, AT&T, Charter, etc. 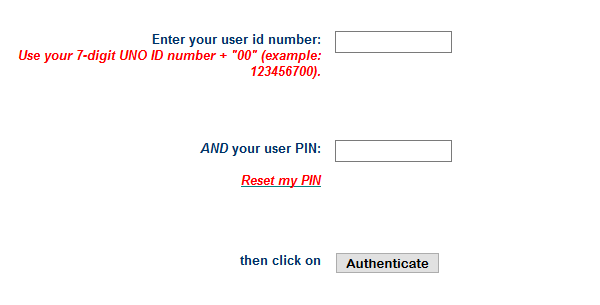 ), you will be prompted to log in using your 7-digt UNO ID number + "00" (example: 123456700) and your PIN to access the library's databases. If you have never had a PIN or have forgotten it. You can request a new PIN or have your old PIN reset by contacting the Library Services Desk at circdesk@uno.edu or call (504) 280-6355 during regular business hours, 8am - 4:30 pm Monday-Friday.